I picked up a copy of The Harvest Eating Cookbook by Chef Keith Snow earlier in the summer and read it like a novel. I was fascinated by his lifestyle of cooking and eating seasonal foods. The book itself is inspiring. Despite the fact that Keith is a professional chef, his recipes are not intimidating and are written in a way that will inspire simple home cooks like myself to prepare these delicious recipes and eat seasonally. 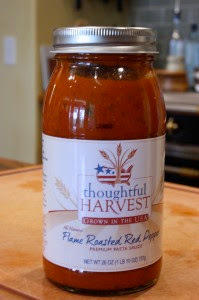 I was so excited when I learned about Chef Keith Snow's new venture, Thoughtful Harvest. 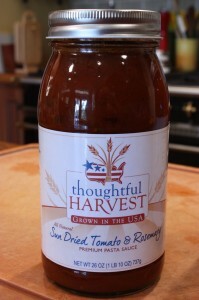 Thoughtful Harvest Tomato Sauces are created by Chef Snow to provide consumers with an alternative to highly processed store-bought foods. This Chef uses the best ingredients from US based, local family farms and artisan producers. His pasta sauces are formulated by him and created in his very own kitchen! Amazing!! I couldn't love this more. On nights when life is too crazy to Prep Ahead, you can pop open a jar of this premium tomato sauce and dinner is still homemade, fresh from Chef Keith Snow's very own kitchen! 1. Go to the Prep Ahead and Dine In Facebook Page and "like" it! 2. Leave a comment below this post indicating that you are entering the giveaway! One lucky winner will be chosen at random. The contest ends Friday, August 27th 11:59 pm EST. Good luck! Yum!!! Love your blog Jaime!! Such good ideas and recipes, cant wait to try some!! Two great blogs -- and one fine giveaway. Best to you both! I am entering the Prep Ahead and Dine in contest! It's so great to stumble upon a blog like this! What a wealth of information and recipes you have! Thank you! I am entering the giveaway - great to discover your blog! I would love to win the premium pasta sauce. Thanks for the opportunity. Entered the giveaway! Glad to find your blog love good and easy. I am entering the giveaway! yumma! This stuff looks out of this world delicious!!! !..Thanks for posting this for me to find and enjoy!! I am already a fan of theirs, I would LOVE to win this! So excited to try all of these recipes, now that the kids are going back to school-thanks Jaime!! Copyright © PrepAhead and Dine In: Thoughtful Harvest Giveaway. All Rights Reserved.